Below is a brief account of the very disturbing story of 23 year old Jewish student Ilan Halimi who was kidnapped tortured and murdered by a gang of Muslim youths in Paris in 2006. The trial began today. I have only become familiar with this story recently and can't help wonder why that is. If there were a gang of white supremacists doing the same to black youths in France it would rightly make international headlines. This case has not. Why ? Might it be the French trying play down the anti Semitic motive of the gang. I think what we are seeing here is French sensitivity to claims of anti Semitism. This sensitivity comes from France's reluctance to firmly come to terms with its controversial history regarding its treatments of French Jews. Fine Gael leader Enda Kenny and his party colleague Alan Shatter TD have just returned from a three day tour of Israel and Palestine. For my non Irish readers let me explain. Enda Kenny is the leader of Ireland's largest opposition party and Alan Shatter is Ireland's only Jewish member of parliament and the countries most vocal supporter of Israel. 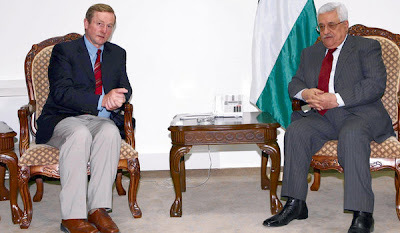 The two men, accompanied by Billy Timmins TD, Fine Gael spokesperson on defence visited Gaza, Sderot and Ramallah as well as Jerusalem where Enda Kenny held talks with Israel’s deputy foreign minister Danny Ayalon. In Ramallah Kenny met with Mahmoud Abbas, president of the Palestinian Authority. Fine Gael is Ireland's most pro Israeli party. This is not simply because of deputy Shatter's efforts to combat anti Israeli sentiment throughout the nation. Fine Gael are a member of the EEP, the conservative block in the European parliament that regularly defend Israel. Not that any of this makes much of a difference in any practical sense as I do not believe that either Fine Gael or Enda kenny have any ambition to do anything other than play it safe when it comes to the Israel Palestine debate. The only issue of note that appears to have come from the Fine Gael tour of the holy land was Kenny's genuine shock at the devastation in Gaza and his pledge to raise the issue of the ongoing suffering in Gaza at the EU level. Interesting, but hardly an uncharacteristic bombshell from the Mayo man. Most people prefer the first more famous movie about the British Zulu war made in 1964 simply titled Zulu. You know, the only movie where Michael Caine plays a posh Englishman. 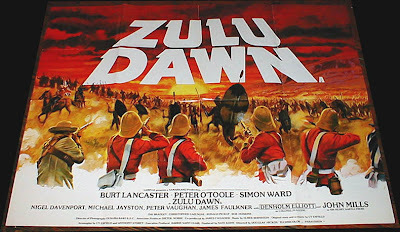 I however prefer the prequel Zulu Dawn made in 1979 on what was the 100th anniversary of the battle that the movie depicts. This is the battle of Isandlwana famous because it was the greatest ever defeat of a modern army at the hands of a native force. Zulu Dawn basically tells the story of a battle between 20,000 Zulu Warriors who succeed in overpowering 1700 British soldiers. The result, every last single British soldier was killed. Just to clarify, many people get confused between the battle of Islandlwana and the battle of Rourkes Drift. Rourkes Drift is depicted in the 1964 movie where 150 British soldiers manning a supply station hold out against 4000 Zulus a day after the slaughter at Islandlwana. Rourkes Drift at the time and to an extent in the movie was portrayed as a great British victory which it was. In reality though it was a small victory in a much larger defeat as only 24 hours before the siege of Rourkes Drift 1700 British Soldiers were wiped out at Islandlwana. The movie Zulu goes to great lenght to emphasise that out of the 150 defenders of Rourkes Drift 11 won the Victoria Cross. Anybody who knows anything about the British military understands how unbelievable this is as to win the VC you have to commit an act of insane bravery. There are very few VC's awarded so for 11 to be awarded from 150 is almost suspicious. And here in lies the interesting point. Queen Victoria and British Prime Minister Benjamin Disraeli were so horrified at the defeat at the hands of a bunch of natives throwing spears that they had to attempt some damage limitation. They did this by highlighting the victory at Rourkes Drift with 11 VC's and attempting to sweep the defeat at Islandlwana under the carpet. I'm not saying the defenders of Rourkes drift were not as hard as nails but the main story from the entire British Zulu war and the word that should always be synonymous with it is Islandlwana. The movie has an all star cast. 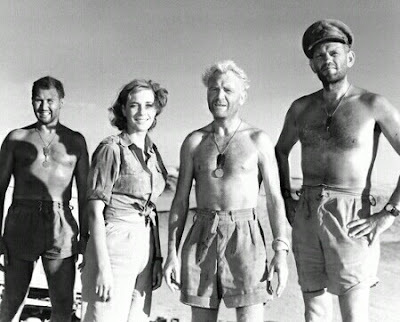 The great Johnny Mills (who also featured in my No 10 Ice cold in Alex) and Peter O Toole lead the way as the Architects of the war. The audience soon developes contempt for both men particularly O'Toole for carelessly and arrogantly splitting his forces leaving the 1700 men at Islandlwana exposed. Among those actually doing some fighting are Burt Lancaster (who plays a gritty Irishman), Denholm Elliot and Bob Hoskins. The story is quite simple really. We see a catalogue of errors that soon see 1700 British soldiers alone and exposed facing up to 20,000 Zulus. The tension as the build up to the battle draws near is simply superb. And when it begins, sheer terror ensues as the movie plays on the greatest fear of every white man, that being the prospect of getting chopped to death my a mob of angry black men. 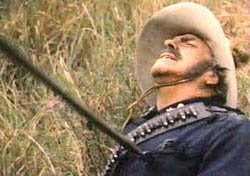 The battle scene lasts a good 25 minutes as things go from bad to, well, as worse as things can possibly get. You keep thinking that some one or some group will survive but no. Survivors get smaller and smaller in number. In reality I believe there were a handful of survivors but literally less that ten and these were mainly men who were sent to get help during the battle. Zulu Dawn however does not detail any of these stories. The movie in fairness does portray the courage of both the British and the Zulus. The real villains are the generals and politicians who wanted it and who find themselves sitting back enjoying the comforts of colonial life in Natal when the fighting gets going. I think my favourite scene is the one where Bob Hoskins desperately tries to keep the front line together as wave after wave of Zulu warrior advances. The events at Islandlwana was Britain's greatest defeat in all its colonial wars. Among the Zulu people of South Africa it has been celebrated as their greatest victory, that is until today. Because today a Zulu warrior has been elected President of South Africa. 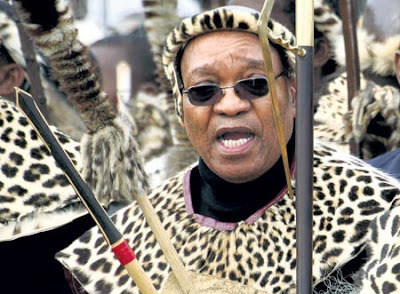 That's right, Jacob Zuma is from the Zulu tribe. Nelson Mandela and Thabo Mbeki were both from the Xhosa tribe which is perceived as being the more sophisticated of South Africa's tribes much to the resentment of the Zulus. Zuma has claimed that his ancestors fought at Islandlwana and has regularly invoked the spirit of the Zulu warriors of old to inspire current generations. Zulu Dawn is a powerful and frightening movie and ultimately I believe quite a potent anti war movie as the hell the soldiers are forced to go through in the name of conquest is something which you wouldn't wish on anyone. For the tension, for the action and the horror, for Bob Hoskins' brilliant performance as a drill Sargent and for the unforgettable soundtrack, Zulu Dawn is a must. Following on from my recent piece on Iran I have come across something interesting that demonstrates Iranian nationalism and sense of grievance Iran feels at not being shown the respect it says it deserves. 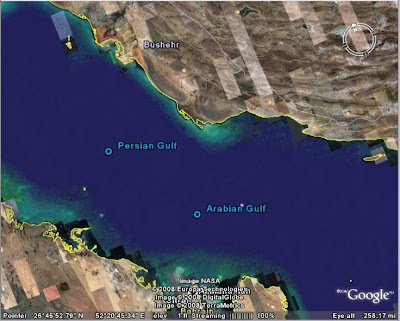 In November 2004, National Geographic published a new edition of their World Atlas in which they labeled the Persian Gulf as the Arabian Gulf. Big mistake. Although Arabs and Persians have been fighting over the region for thousands of years, the latest installment of which being the 8 year Iran Iraq war in the 1980s, it has long been accepted that the official name of the Middle East shipping lane is the Persian Gulf. So when the National Geographic published its Arabian Gulf edition it resulted in the wrath of Iranians world wide. From wealthy American Iranians to the Mullahs of Qom, from exiled Marxists to revolutionary guards, all Iranians were briefly united in their condemnation of Persia's enemies in the national geographic. One enterprising young individual of Iranian decent who worked for google even got in on the act. Still today if you google the words Arabian Gulf you will be met with a firm rebuttal about the existence of such a thing. Try it and click the "what is this page" link to receive an explanation. Such was the uproar that the National Geographic were forced into a u-turn. So what point am I making here. Well very little to be honest. But I think this episode does illustrate Iranian pride and how ignoring it or trivialising it does does genuinely harm relations between Iran and the west.Obama's strategy of treating Iran as more mainstream nation rather than a rogue state may well succeed in convincing Tehran to respond positively to Washington's olive branch. I am glad that Daithí Ó Ceallaigh, Ireland’s ambassador to the UN in Geneva was among those who walked out during Ahmadinehad speech yesterday. And frankly I think the United States, Canada, Israel, Australia, New Zealand, Germany, Italy, Poland and the Czech Republic were right to boycott it in the first place. The 2001 conference of the same name that was held in Durban South Africa turned out to be a complete joke as the worlds worst dictators accused Israel of being the most racist country in the world as well as a prime human rights violator. It is a perverse manipulation of reality for an African dictator, most of whom promote horrific sectarian and tribal violence in their own countries to accused Israel, a country whose fiercely independent judiciary ensures that all persons, political and military obey the law of being a racist country. 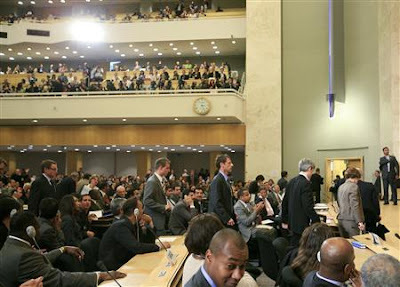 The reason the US and others decided not to attend the conference at all was was an introductory line in its draft declaration that "reaffirms" the text adopted eight years ago. While the Geneva document excludes references to Israel and the Middle East, the 2001 text includes six paragraphs on those subjects (Reuters). In other words it was feared that Geneva would be a repeat of Durban. Ahmadinejad's words were certainly in line with Durban. "Following World War Two they resorted to military aggressions to make an entire nation homeless under the pretext of Jewish suffering." "And they sent migrants from Europe, the United States and other parts of the world in order to establish a totally racist government in the occupied Palestine." "And in fact, in compensation for the dire consequences of racism in Europe, they helped bring to power the most cruel and repressive racist regime in Palestine." The reason the Durban conference caused such an uproar was the attempts by the delegates to equate Zionism with racism in a repeat of the infamous UN general assembly resolution in 1975. Once it appeared that it might be on the agenda again in Geneva the US, Israel and others said no thank you. I take Zionism to mean the concept of a Jewish state in Palestine. I do not believe that this is a racist concept. I believe that the Jews, just like the Kurds and the Palestinians and the Tibetans are entitled to a homeland. However I do accept that the idea that any Jew from anywhere in the world is entitled to migrate to the holy land and live in a Jewish settlement in the West Bank simply because of a biblical connection where as a Palestinian that lived there for generations has to give up the right to return is a bizarre concept with racial connotations. However I have enough moral clarity to recognise when a regime is using Israel bashing or equating Zionism with racism to distract the world from their own short comings. So should all right thinking people. I want to do a further piece about Obama's recent address to the Iranian nation. I covered this three weeks ago but didn't have the time to elaborate as it was during my exams. Here's a quick reminder. I have said many times before on Gubu World that the Iranian nation craves respect. All Iranians whether they be a mullah or Marxist, loyalist or dissident intensely resent the way the western world particularly America appear to treat Iran like nothing more than a banana republic. There are many examples of this. But perhaps the most important to note is the circumstances surrounding the coming to power of the Shah (King) of Iran in 1953. In a very murky episode the CIA in what was to prove the first of many cold war ventures decided to remove the popular leader of Iran whom they feared was getting to cozy with Moscow and reinstate the pro western Shah who had been deposed several years earlier. 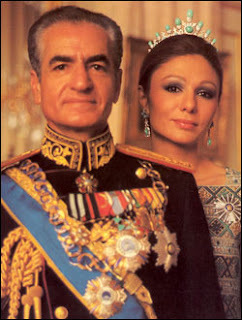 The Shah went on to rule for a further 26 years until he himself was deposed by Ayatollah Khomeini. It is impossible to understate just how personally Iranians took this. That America felt entitled to infiltrate Iran and alter it politically to suit Washington's interests is a source of humiliation that is burned into the Iranian psyche. Iran, the great Persian civilisation that has contributed so much to world civilisation deserves more respect than to be a mere instrument of US foreign policy. The 26 year rule of the Shah was relatively brutal but if the truth be told its not so much his authoritarianism that infuriated Iranians. It was the fact that he was such a blatant puppet of the US. Satisfying his American sponsors often seemed to be of greater concern to him than Iranian national interest. He even appeared to be ignorant of many ancient Persian customs instead favouring a western lifestyle. For such a proud people this was just too much. The humiliation has continued in the eyes of the Iranians even after the Shah was ousted. An entire Iranian generation (600,000 dead) was wiped out in an 8 year war with Iraq that Saddam Hussein would never have been able to sustain had it not been for western support. An Iranian passenger jet was shot down by the US warship Vincennes in 1989 killing all 290 on board, the US has never apologised. And George W Bush publicly reserved the right to topple the regime through covert action in what would be a repeat of the 1953 episode. I doubt he was ever aware how this type of language really stung in Iran. Many Iranians that voted for Ahmadinejad in 2005 did so claiming that it was a rebuttal to Bush and a desire to to see the countries future decided by Iranians, not Americans. The Iranian government officially site the two principle reasons that there is hostility between the two nations as being the presence of US forces in the Persian Gulf and the lack of respect that is shown toward the Iranian nation by the United States. The question now is how will Obama's words go down in Iran and might this new found respect that the US is showing result in a change in Iranian policy. There is no doubt that his acknowledgment of the Iranian new year and his praise for the ancient Persian civilisation and its culture will go down well in the Bazaars as will his few words of Farsi at the end. Worth noting also is his use of Iran's official post revolutionary title "the Islamic Republic of Iran" which appears to be an acknowledgement of the current regime as the legitimate leaders of the country, something no administration has ever done. His use of the words "mutual respect" and "committed to diplomacy" signal an intention to indeed treat Iran as a more mainstream nation and not a rogue state as Bush declared it. This is fascinating stuff. Iran's response over the next year will indicate a lot about the true nature of the regime. What we are seeing here is the classic question of, do they hate us because of who we are or because of what we do? Iran's response to Obama's message will answer this controversial question. And as we have seen this week Iran has an opportunity to respond with the case of Iranian-American journalist Roxana Saberi who has been jailed for 8 years for spying for the US. As ever Gubu World will keep its readers informed. As a little distraction I have decided to preview my top ten favourite war movies on Gubu World. I love war movies. Not just for the action but for the emotion they can provoke. A war movie has done its job if you the leave the cinema feeling sick and disgusted. The story has to be gut wrenching. If after the movie you find yourself saying "I would have loved to have been around in them times" then it is most probably a bogie movie. Throughout the movie there is a constant back round theme involving alcohol. Mills' character is a ferocious alcoholic but unfortunately for him he has no booze on this trip. All he can think about is this pub he knows in Alexandria that serve the best Lager he knows. He mentions on several occasions his intention to head straight to this pub for a beer if they ever reach Alexandria. Many things happen during this journey which make us doubt they will ever reach Alexandria. There are run ins with Germans, with locals and perhaps the greatest danger of all is the ambulance itself and whether it will make it thought the Sahara desert. My favourite scene is one where the ambulance has broken down and they have to push it up a hill by winding the axle manually. The tension is unbearable and you feel their strain as it takes several winds to move the wheel forward just a few inches. When almost at the top the axle slips and the ambulance rolls back down a couple of hundred feet to the bottom of the hill. It is horrifying to watch and it actually makes you thirsty. Incidentally if you are watching this movie on DVD I suggest doing so with a few cans of booze to ease the pain. Ice Cold in Alex folks, my tenth favourite war movie, its a must. I lived in Dubai for nearly two years. Contrary to most expats living in the emirates my experience living and working among Arabs caused me not to jump on the Israel bashing bandwagon but to actually separate myself from it as clearly as possible. Let me explain why. The main difference between an Israel basher and an Israel supporter is that the former believe that Palestinians hate Israelis because of what the Israelis do where as the latter claim its because of who and what Israelis are. I think any reasonable person will admit that its actually a combination of both. 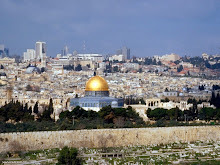 However, during my time in the UAE and traveling throughout the Arab world generally I frequently witnessed and heard things that made it obvious to me that raw Arab hatred of everything Jewish is behind much of the Arab world's opposition to the state of Israel. In a recent Newsweek article journalist Josef Joff elaborated on this issue. Below is an extract of that article. For a European, it all feels uncomfortably familiar. Take the cartoons one sees in the government-controlled Arab press. They feature The Jew as a murderous conspirator, a capitalist bloodsucker or Satan himself—the classics. He even looks like his predecessors in Der Stürmer, with his hooked nose, thick lip and sinister beard. Open Egypt's Al-Gomhuria newspaper, and there is The Jew as a serpent strangling Uncle Sam over a caption that reads "The Jews taking over the world." On Al-Nas TV, Egyptian cleric Ahmad Abd al-Salam tells his viewers, "I want you to imagine the Jews sitting around a table, conspiring how to corrupt the Muslims … The Jews conspire to infect the food of Muslims with cancer [and] to ship it to Muslim countries." Al-Salam's colleague, Zaghloul al-Naggar, has called Jews "devils in human form." And this is a country at peace with Israel. Joseph Goebbels, the Nazis' chief propagandist, would be proud. Meanwhile, Saleh Riqab, Hamas's deputy minister of religious endowment, has picked up smoothly where European anti-Semitism leaves off, declaring on TV that "the protocols of the elders of Zion discuss how the Jews should seize control of the world. In Europe, and especially in the U.S., there was a quick Jewish takeover of the major mass media." One Egyptian cleric has even voiced the widely shared opinion that "Judgment Day will not come until the Muslims fight the Jews." So much for a two-state solution. I witnessed this form of anti semitism first hand during my time in the UAE. Perhaps unlike most expatriates my interest in world politics convinced me not to avoid sensitive conversations with locals about regional issues. As a result it soon became clear to me that Arab hatred of Israel is about much more than the Israeli occupation of Palestine. In previous attempts at seeking peace in the Middle East this problem has largely been ignored as it was decided to focus on borders, refugees and settlements. I believe that this is about to change. President Obama has indicated his desire to prioritise Middle East peace by sending George Mitchell to the region as a special envoy. Tony Blair has also been working feverishly behind the scenes for nearly two years now in his role as a special representative of the quartet. So what exactly have Mitchell, Blair and others been doing all this time. I believe that as part of an overall peace plan they have been journeying to Arab capitals attempting to convince Arab leaders to sign up to a deal that includes universal Arab recognition of Israel in exchange for a complete Israeli withdrawal from the West Bank including settlements. There is one obvious problem with this. How could an Arab leader sell to his people a deal that recognises Israel when they have tolerated and even encouraged for so long the type of anti Semitic rhetoric described in the above article. This is where Blair and Mitchell come in. This deal, the details of which I believe will burst on the international scene later this year, goes further than mere recognition of Israel. After all, Egypt and Jordan recognise Israel yet they are among the worst offenders when it comes to Jew bashing. This deal will I believe emphasise that recognition on paper is not sufficient and in order for there to be a lasting peace between the Arab league nations and Israel the Arab nations are going to have to refrain from and ultimately combat the anti semitism that manifests itself in Holocaust denial and "blame it on the Jews" type of politics. This is vital for the following reasons. In order for there to be permanent peace between Israelis and Palestinians there must be an end of Arab opposition to Israel. Realistically, for a peace deal between Israel and Palestine to last it must be supported in the wider Arab world. This cannot happen as long as anti Semitism is so acceptable in Damascus, Riyadh and Abu Dhabi. Last week a Palestinian man from the West Bank managed to infiltrate the controversial Jewish settlement of Bat Ayin where he attacked two children with an axe. One 13 year old was murdered and a seven year old was severely injured. The Palestinian man has escaped. 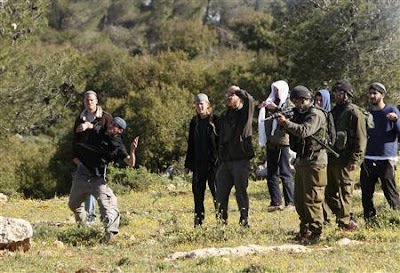 This has led to a series of clashes between Jewish settlers and local Palestinians the latest of which occurred earlier today when dozens of Jewish settlers rampaged through the tiny Arab village of Safa attacking several Palestinians and damaging property. I am not going to get into a discussion about the rights and wrongs of Jewish settlements here only to say that this incident, fairly common as it is demonstrates clearly in my eyes the impracticality of these settlements being located where they are. It is just so blindingly obvious that they will have to be removed if there is to be a viable peace settlement. Those God awful FE1 exams are over with for now. I have another four to do in September but lets not dwell on them. I did very little blogging over the last three weeks. I missed it. When I don't blog its amazing how out of the loop you get so quickly. I feel like I'm playing catch up on world events. Here is just a few things that caught my eye in the last few weeks that I didn't have time to post about. 1. The Israelis announced only last week that during the January war in Gaza the Israeli Air Force bombed a 23 truck convoy in Sudan which they believed was an Iranian shipment of weapons headed for Gaza. Wow , I think the Jews call it chutzpah. Clearly this was a message for the Iranians. Not only in that Iranians were believed killed in the incident but it was the Israelis saying, we are not afraid to take action well outside our airspace. 2. Benjamin Netenyahu finally managed to negotiate a government which is due to be sworn in today. Given the points made in #1 I think it is quite possible we could see an Israeli air strike on Iran before the summer. 3. There was an international meeting in Holland last week to discuss the future of Afghanistan. NATO was there as were many NGO's to discuss development issues. All regional nations sent delegations including the Iranians who pledged to actively cooperate in combating the heroine smugglers that operate along the Afghan Iranian border. I was near the Afghan border back in 2004 when I traveled to Iran, truly bandit country. The Iranian delegation met with Hillary Clinton. Is this a sign of things to come ? 4. There have been fatal clashes in Iraq between the Shia dominated military and the Sunni fighters that have been tasked with the job of fighting Al Qaeda. This could be every ones greatest fear coming true. The Sunni (sons of Iraq) are former insurgents who in 2007 were persuaded to turn against foreign Al Qaeda fighters in western Iraq. This was a successful tactic but many warned that integrating them into the Iraqi army afterward would be next to impossible due to sectarian tensions. If this fear is realised it could mean that all the progress achieved in Iraq over the past 18 months could be reversed in a new phase of sectarian bloodshed. Ahhh.... Its good to be back.